A versatile modern electric tool used in woodworking and with some plastics. The plunge refers to the fact that the machine normally has the cutter retracted when not in use, but when the base is unlocked it can then enter the work. An externally coned sleeve with two or more slits in it. In conjunction with a nut it is used to grip round material or tools. 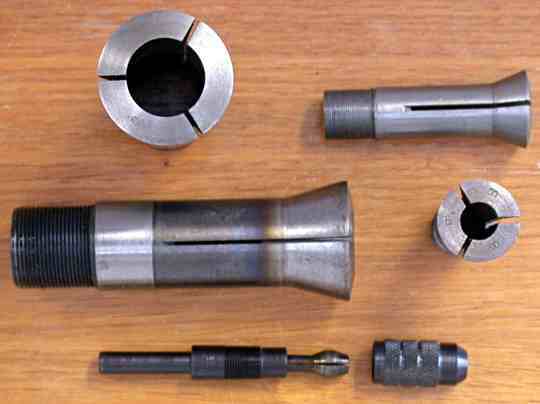 Also know as a Collet Chuck. 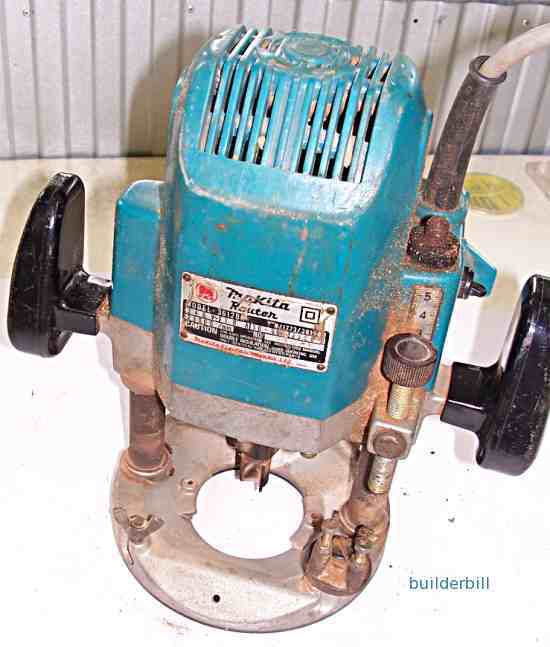 Used for example in wood routers, dremel tools and high speed grinders. A device to make repetetive work easier. At the same time it makes it more accurate and faster. Ranges from home-made to highly complex. Purpose made cutters to be used with machine routers. The Makita plunge router above is in the switched off position. It can be turned on quite safely, moved to the work area and when the lock is released it can be slowly plunged into the working position. In addition the machine has a three step depth stop so that if a series of deep trenches have to be done then the depth stop can be set up at the start of the job and then as the various depths are cut the depth stop can simply and quickly turned to the next setting. Wood routers of this class typically rev at about 22,0000rpm. That is extremely fast so only use good quality and good condition tool bits that have the right speed rating. If you damage a bit, throw it away! The collet capacity is 12.7, that's half an inch. Other smaller collets are also supplied to use smaller bit sizes. ALWAYS use the correct collet set for each bit. There is very little tolerance. The standard plunge router comes with a couple of accessories. The one that allows it to work under control without any additional aid is the Adjustable Fence. Much like an add on fence to a power saw it can be fixed to the base of the machine. A temporary or permanentRouter Jig. often home made but sometimes store bought. Often used in conjunction with the other useful accessory, a base plate collar. The use of specially designed cutters with Ball Bearing Guides for working on edge moulding or trimming. Jigs for various jobs are very convenient and they always repay the time spent making them. In the photo above Jim has made up a piece of plywood to act as a pattern for routering bookcase ends. 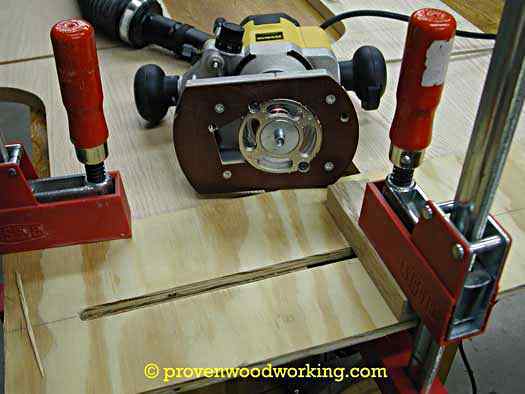 See my page on making router jigs and in particular a jig for routering stairs. 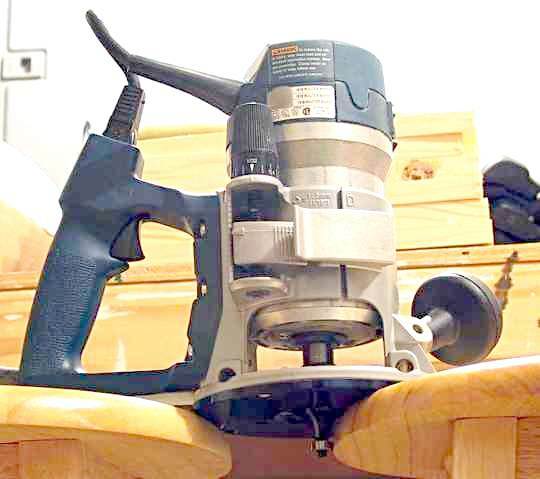 Another way of controlling a router is to use one of the many ball bearing router cutters. These have a bearing at the end of cutter and it is allowed to touch the work edge and the operator just keeps a contact with the edge and follows the shape. Router Cutters come in a variety of patterns and increasingly the use of ball bearings are seen to make edging moulds quick and easy to make. In the old days it was common to see the riding tip made of the same HSS steel the same as the cutter itself. This was mostly a failure as the high revving cutter produced burn marks on the timber. Enter the ball bearing. Another worth while improvement to the cutters was the almost universal use of tungsten carbide tipped cutters. All of the ones in the photo above are TCT. They keep their edges far longer than HSS cutters. 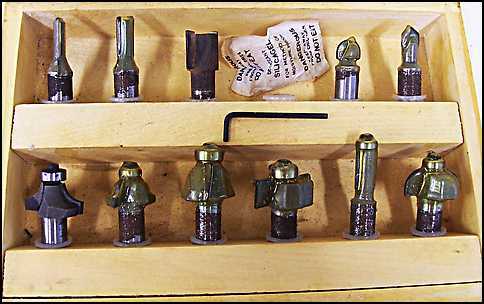 A far more precise and secure way of holding round tools like plunge router cutters is the engineering item called a Collet. Something like a three jawed chuck similar to what is used in electric drills is just not good enough for a high speed router. For a tool that spins at 22,000rpm then the slightest inaccuracy spells disaster. Never, not ever, place anything but a recognised router bit or cutter in one of these machines.